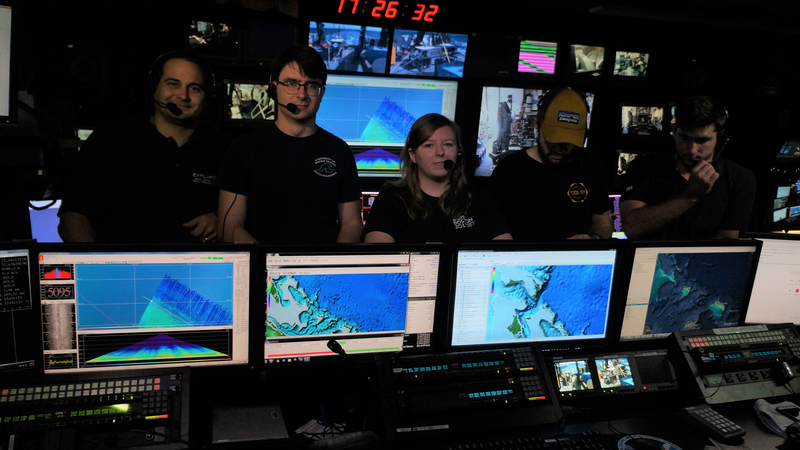 Nick, Sean, Allison, Josh, and Grady in the Okeanos Explorer control room for a live interaction with the University of Rhode Island Inner Space Center. Image courtesy of the NOAA Office of Ocean Exploration and Research, Mapping Deepwater Areas in the Caribbean and South Atlantic Bight. Download larger version (jpg, 2.1 MB). Hi! My name is Allison Redington and I am a part of the University of Rhode Island (URI) 3D printing team. First, I would like to say that it is an amazing opportunity for us to be out here and that we are extremely grateful for this experience. There are a lot of wonderful people on board and it is awesome to hear about what they are working on. 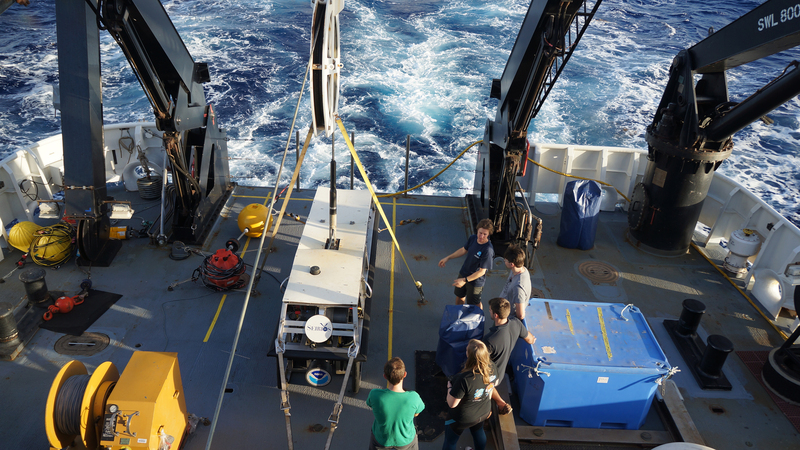 Today has been a fairly busy day for us on board NOAA Ship Okeanos Explorer. We started our morning with Warren Taylor and a tour through the engine rooms on board. 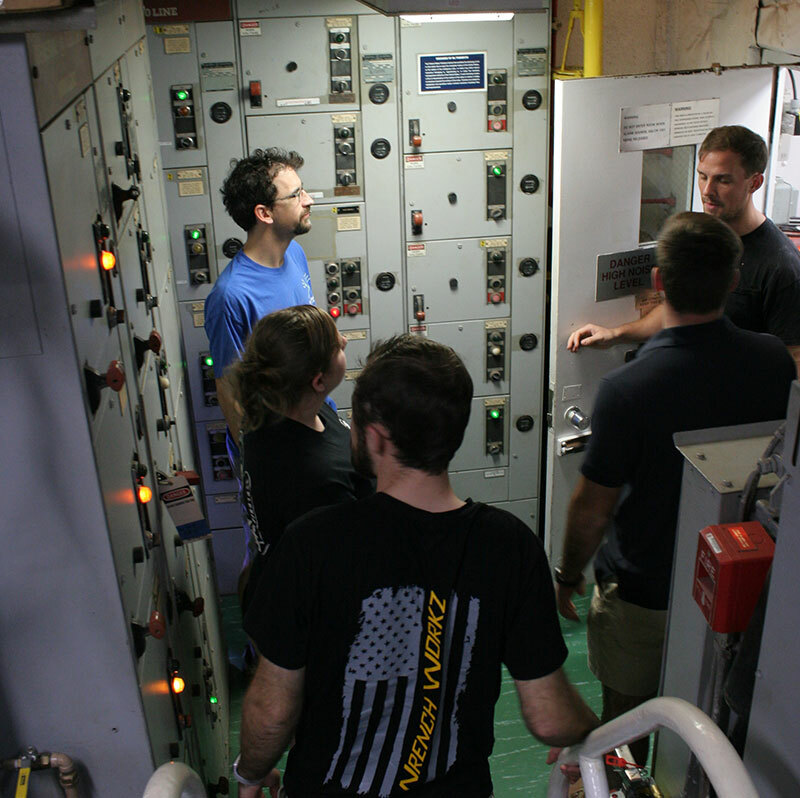 He talked to us about several systems on board and what they do to allow the ship to function day-to-day. 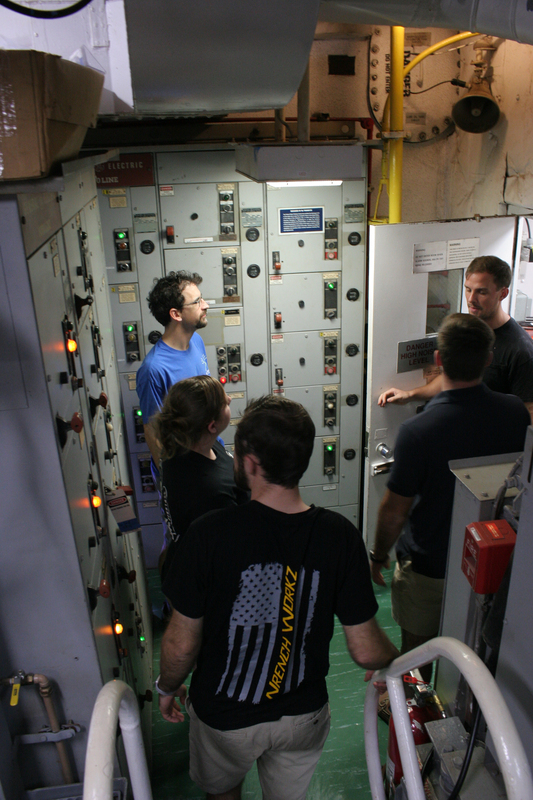 Warren shows the team through the engine room. Image courtesy of the NOAA Office of Ocean Exploration and Research, Mapping Deepwater Areas in the Caribbean and South Atlantic Bight. Download larger version (jpg, 3.7 MB). After the tour of the engine rooms, we spent some time starting a new print on the printer and prepping the 3D printed pressure housings for the CTD run tomorrow morning. We have had time to print one pressure housing on board so far, and a second one will be done early Saturday morning. 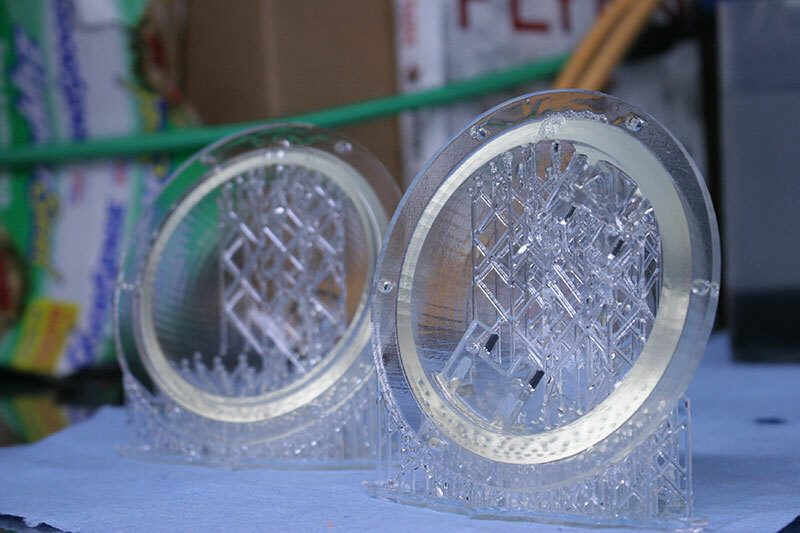 We are planning on sending two housings down to 200 meters, one that was printed on land and one of the two printed at sea. It is really neat to be able to use this technology to print something at sea and then be able to use the final printed product out here the next day. Sean and Grady working seamlessly to switch out a completed print on the 3D printer and start a new one. Image courtesy of the NOAA Office of Ocean Exploration and Research, Mapping Deepwater Areas in the Caribbean and South Atlantic Bight. Download larger version (jpg, 3.5 MB). 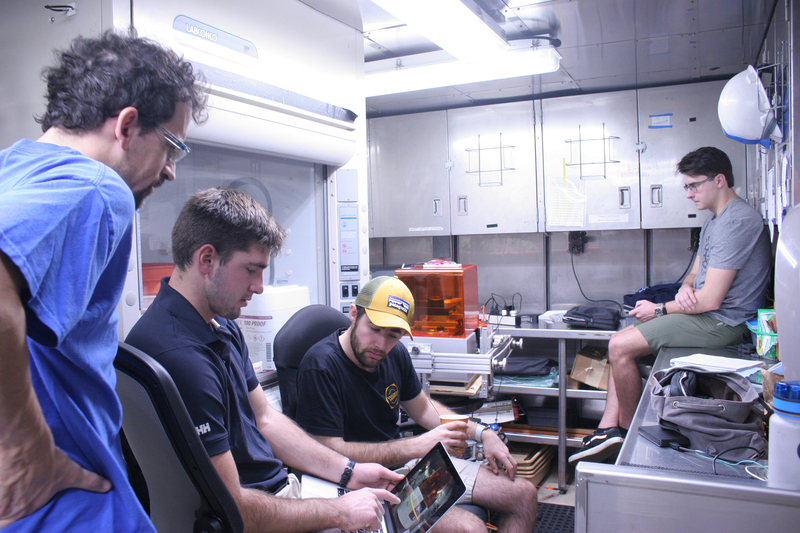 Josh, Sean, Grady, and Professor Licht looking over time-lapse footage of the 3D printer. Image courtesy of the NOAA Office of Ocean Exploration and Research, Mapping Deepwater Areas in the Caribbean and South Atlantic Bight. Download map (jpg, 3.5 MB). 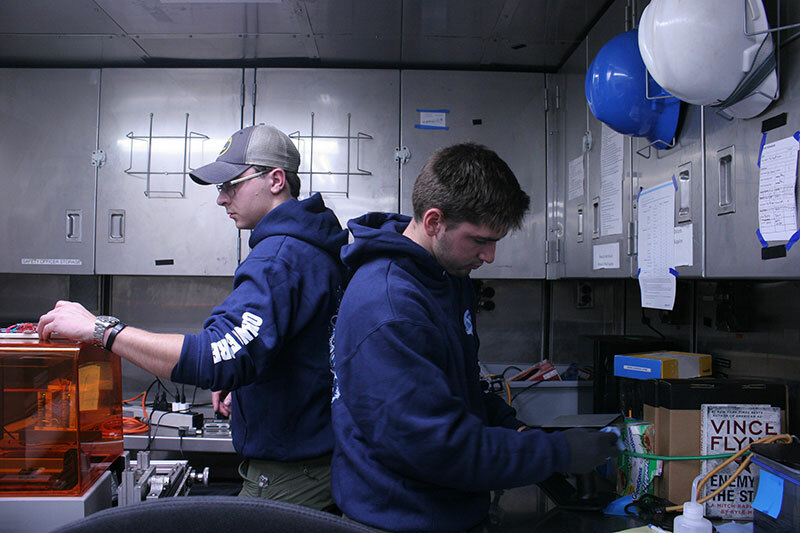 Allison and Josh work with Professor Licht and Charlie to find a mounting solution for the pressure housings. Image courtesy of the NOAA Office of Ocean Exploration and Research, Mapping Deepwater Areas in the Caribbean and South Atlantic Bight. Download larger version (jpg, 3.3 MB). After lunch today, we were able to participate in a live interaction with some students from Indiana as well as Professor Phillips and Catalina Martinez at the Inner Space Center at URI. It was cool to talk about the project and answer their questions. I’d like to give a shout out to Roland Brian and everyone else behind the scenes that makes these live events possible. It takes a lot of people to make them happen. 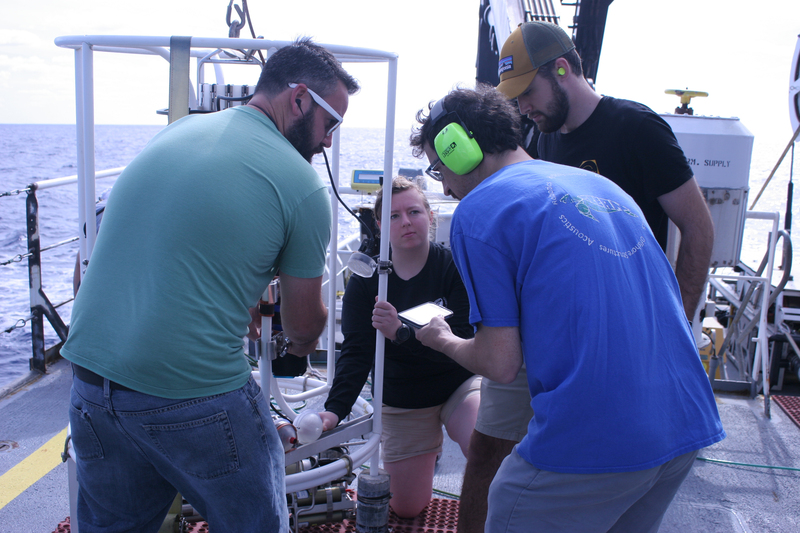 Later this afternoon we got to spend some time with Todd Gregory, who showed us around the remotely operated vehicle (ROV) on board, Deep Discoverer. We also got to look at its camera sled Seirios. I would say this was one of my favorite parts about the trip so far because I have been interested in underwater ROVs since I was little, so it was really cool to see one up close and be able to ask questions about it. I would love the opportunity to work on these types of vehicles in the future. Team 3D talking to Todd about Deep Discoverer in the ROV hangar. Image courtesy of the NOAA Office of Ocean Exploration and Research, Mapping Deepwater Areas in the Caribbean and South Atlantic Bight. Download larger version (jpg, 2.6 MB). 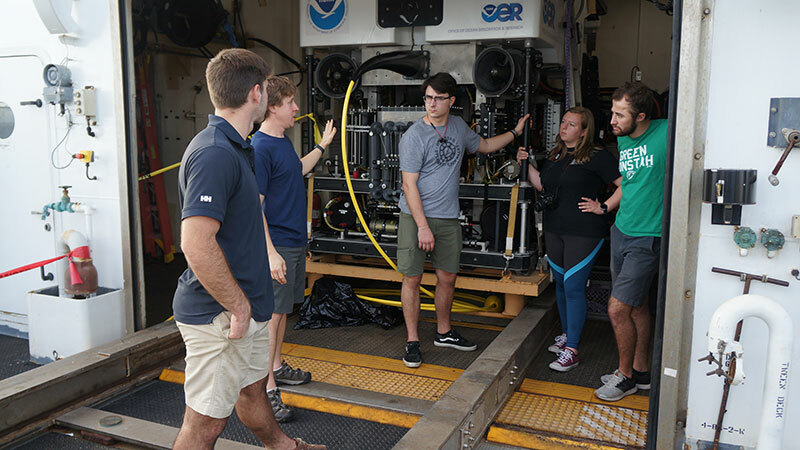 Todd talking to Team 3D about Seirios on the deck of the Okeanos. Image courtesy of the NOAA Office of Ocean Exploration and Research, Mapping Deepwater Areas in the Caribbean and South Atlantic Bight. Download map (jpg, 3.6 MB). We wrapped up our evening with dinner on the deck as the sun set behind us, preparing for the pressure housing tests tomorrow morning. I am excited to see the GoPro footage from the tests and how well our printed housings perform. I am sad that our time on board is coming to an end. Thank you again to everyone on board for having us along and I hope it won’t be our last time. The first pressure housing for the CTD printed at sea by Team 3D. Image courtesy of the NOAA Office of Ocean Exploration and Research, Mapping Deepwater Areas in the Caribbean and South Atlantic Bight. Download larger version (jpg, 4.1 MB).